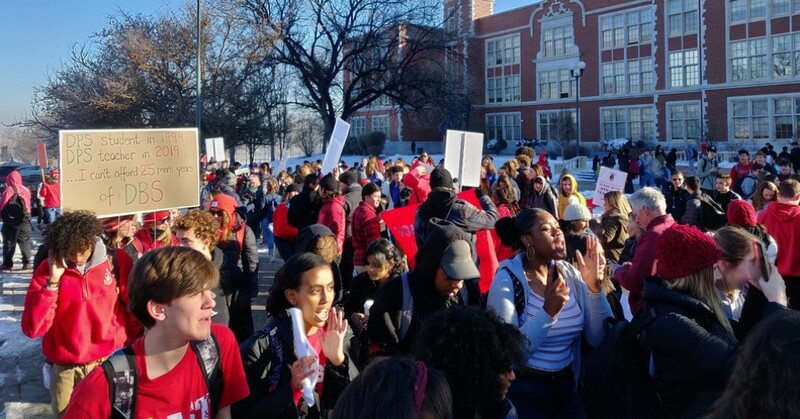 The walkout is the district’s first in about 25 years, with teachers decrying their chronically low pay resulting from an incentive-driven compensation system, and the suffering it inflicts on Denver’s 71,000 students. The main issue teachers are striking over is a compensation system which they say favors giving out incentives over base pay, making it hard for the district to attract and retain qualified educators. More than 30 percent of Denver teachers have been in the district for three years or less, according to DCTA. Under the compensation system, teachers are given financial incentives to teach hard-to-staff subject areas and schools. This keeps base pay at an average of $43,255 per year, according to USA Today—an amount that makes it hard for many to make ends meet in Denver. CNN shared stories on Monday of the struggles of some Denver teachers, including a physical education teacher who drives a Lyft on off-hours to cover his bills, a Spanish teacher who hasn’t made enough in nine years of teaching to start a savings account, and two teachers who are considering leaving the field because they can’t afford to live on their paltry salaries. Over the weekend, the DCTA rejected DPS’s offer of more funding for base salaries, as the plan kept incentives in place and “lacked transparency,” according to the union. Also on social media, progressive politicians including Sen. Bernie Sanders (I-Vt.) and Colorado state Rep. Emily Sirota pledged their support for DCTA—with Sirota posting a video from a picket line where she had joined teachers Monday morning.